In the frigid months of January it is all too tempting to sit back, close your eyes, and picture yourself on a tropical beach, a warm breeze blowing through the palm trees, and a good book in your hand. Okay, so I live in Malaysia and have access to tropical beaches all year ’round, but it’s been awhile since I’ve been able to take advantage of that! The instructions will show and describe how to make one tree. Make as many as you need for your craft. Feel free to use any color(s) you wish! For this example I used Lake City Craft papers in tan and holiday green. Roll each strip of paper into a coil and let expand. Glue closed. All pieces are shown below on the right. Shape your pieces. For the tan trunk pieces shape five of them into squares and the other one into a triangle. For the leaves, first pinch into a flat teardrop as shown in the first photo below. Then you can choose how to shape your leaf. You can leave it straight, shape it into a wavy leaf as shown in the second photo, or shape it into a curved crescent as shown in the third photo. I like to do some of each for my trees. All finished pieces are shown on the left. Glue the trunk in a straight line and add the leaves. I like to put the two smaller leaves at the top to make it look like they are further behind, giving a more dimensional look. The tree on the right shows another option. Instead of 5 big leaves and 2 small, you can just do 6 big leaves (all 6 being 6” strips of paper). When making this style I like to leave a space at the top to again give that more dimensional look. 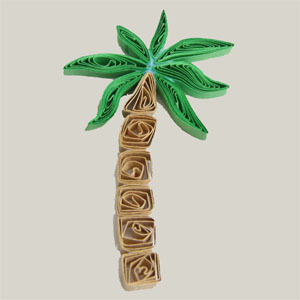 So there you have it, a paper quilled palm tree! This would be great on a frame decorating your summer holiday photos, on a greeting card, or anywhere else you may want a palm tree! I actually used this palm tree as part of my dinosaur collection. I put all the dinosaurs and the palm trees on a frame as a gift for a friend. Click here to view of list of places you can buy quilling supplies from, organized by country! *This post contains some affiliate links. If you make a purchase through the affiliate link I get a small percentage (at no extra cost to you!). I only link to products that I use and enjoy. Thank you for supporting my blog! Hi, I’m not really sure, it is some sort of die cutting machine?